I haven't read a book as utterly fantastic as Unearthly in a very long time. It had been sitting on my shelf for months, untouched and unread, and one day I decided to pick it up on a whim. I'm so glad I did, because I loved it. It had everything I could possibly want from a YA book. One of the things that I enjoyed the most was the fact that this wasn't a "girl discovers what she really is" story. Clara already knew she was part angel, so it saves us from having to go through that period of denial and anger/sorrow that the characters always go through when they find out they're not human. Instead, Clara is facing very different frustrations, as her powers are now maturing and she has to learn how to control them. The angel mythology is very interesting in Unearthly, because it takes the concept of guardian angels and gives it more depth. In this book, all angel bloods has a purpose that they must fulfill. When the novel starts out, Clara had been receiving visions as to what her purpose would be. Her mother then moves them--her, Clara, and Clara's brother--from California to Wyoming so that Clara can get closer to her purpose... which involves a very hot guy named Christian Prescott.There's so much more to the angel mythology, but I don't want to ruin it all. That was one of the best parts of reading, getting to find out more about Clara's angel world. My thoughts? If you're looking for a really wonderfully written and told angel story, with lots of toe-curling romance and awesome mythology, then Unearthly is your book. 5 out of 5 stars. “What do you see in a guy like Christian Prescott?" he asked me that night when he dropped me off from prom. And what he was really saying then, what would have come through loud and clear if I hadn't been so blind was, why don't you see me? I feel like Cinderella sitting in the middle of the road with a pumpkin and a couple of mice, while Prince Charming charges off to rescue some other chick. I think he seriously believes that deflowering and angel could mean an eternity in fiery hell. And then I can feel what he feels. He’s waited such a long time for this moment. He loves how I feel in his arms. He loves the smell of my hair. He loves the way I looked at him just now, flushed and wanting more from him. He loves the color of my lips and now the taste of my mouth is making his knees feel weak and he doesn’t want to seem weak in front of me. I loved this book!! Glad you liked it and thanks for the review. 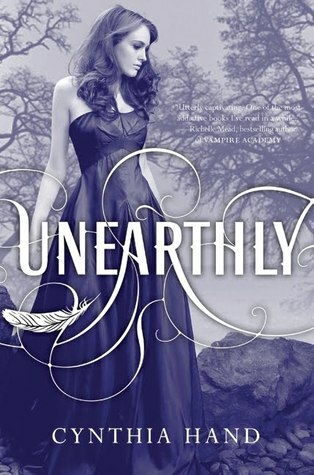 I absolutely love Unearthly too! It was such a beautifully written book and I'm amazed at how Angels seem very different in this book compared to the other angel books I've read before. PS: I'm a new follower too! :) LOVE YOUR BLOG!